Samsung Focus Review - Learn everything you need to know about the Samsung Focus before you buy. 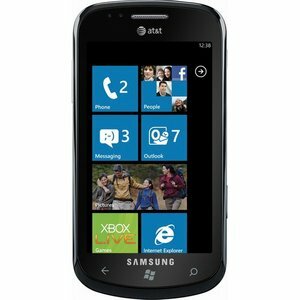 The Samsung Focus (Windows 7 Phone) provides a solid user-interface, some great features and pushes out software updates in a timely fashion. The major downside to the phone currently is the limited use of its features if you are an avid Mac user. The phone has a good battery life, great touch keyboard and a great 5 MP camera for hi res pictures and good HD video. If you are looking for an all around easy to use phone with no real fancy features, this is it. It is the thinnest phone on the market a few millimeters short of the iPhone 4. No physical buttons on the face of the phone give it a super minimalist look and feel. A large, bright 4-inch AMOLED display only adds to the sleek design. The plastic build of the phone make it the lightest top smartphone on the market right now. However, the lightness of the phone tends to make it feel cheap. The Windows Phone +7 OS provides some really great aesthetics but lacks in the area a full social networking experience. Facebook is highly integrated into the phone but it lacks good Twitter and Linkedin support. The Zune media player is a great and if you like to buy a lot of music, then paying the extra $14.99 a month for a Zune Pass will be worth it. The camera on the Focus is really quick and takes great pictures and HD video. A major downside to the Windows 7 OS is the lack of good 3rd-party apps. They might look nice, but the functionality is just not there yet. Bottom line, if you like taking pictures, you will be extremely happy with the Focus. As far as official numbers go, the standby time on the Samsung Focus is around 250 hours which is fairly low in the smart phone arena. The actual usage time is around 390 minutes/6.5 hours which is pretty standard. You will definitely need to charge this phone at night to get a full days use out of it. The Microsoft Office suite comes pre-loaded on the device with which you can view, edit and create documents right on your phone. Not being able to create PowerPoint presentations isn't a big deal, although you can still view them. One thing Windows needs to fix pretty quick is lack of the "Copy and Paste" feature. This will make the Office Suite a bit more attractive to business men on the go. Good news...8 gigs of on board flash storage. Bad news...8 gigs is your only option. You can add an SD microcard but taking the card out requires that you wipe the phone clean. So, buy the biggest one you can afford. For people who are interested in using their phone and data plan as a hotspot for their laptop, the Focus does not offering tethering.